With the arrival of May, we acknowledge and celebrate the teachers in our children’s lives. For this purpose, it is certainly appropriate to extend the definition of “teacher” to include mentors, coaches, therapists, paraprofessionals, and any other support staff who cheer us on during our years in school. We all have fond memories of our favorite teachers: those who look after us, challenge us, and believe in us…even if, perhaps, no one else did. I have a list of teachers I would consider “favorites” from my own school days, and now as a parent, I can see that favorite teachers are still creating lasting impressions on my kids. 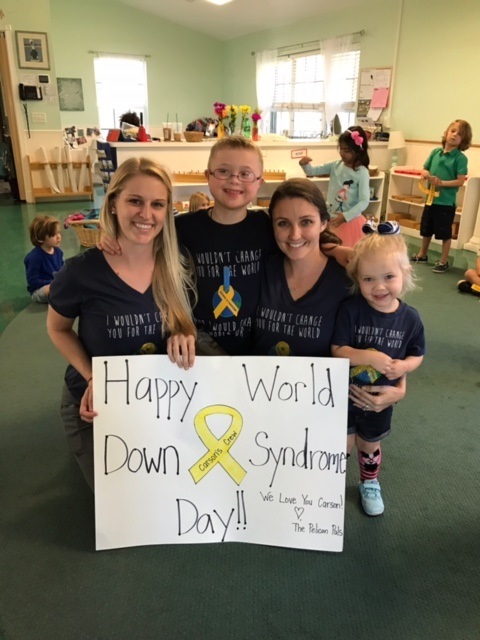 As a mother in the Down syndrome community, I have been fortunate to have an entire cast of supportive people for my son: caring teachers, nurturing paraprofessionals, determined therapists, inclusive dance teachers, and encouraging coaches. Each of these people have contributed to my son’s success in school and in his extracurricular activities, and for them we are truly grateful. Leading up to Teacher Appreciation Week, ds-connex was pleased to once again present the #DsTeachers contest, during which we accepted nominations for the great teachers in your children’s lives. Each heartfelt submission was placed into an album on our Facebook page, and we asked for your votes via likes and shares on the photos. Over the course of a week, we saw nearly 2000 votes for the nine nominees, and their stories reached over 61,000 people on Facebook. Appreciation, gratitude, and trust are certainly evident in the testimonies shared by parents. Mrs. Signore is my daughter, Amber’s, first grade teacher at Stratford Academy, Victoria Soto Elementary in Stratford, CT. She is an excellent teacher who is very creative and quick thinking, to help keep my daughter interested, involved and included within her gen ed classroom! This picture was the week before 1st grade started. Mrs. Signore contacted me and asked if we wanted to bring Amber in to see her new classroom before the first day of school. Amber loved it, and the first day of school was smooth sailing. She is a fantastic teacher with all the kids, and really takes the time to get to know each child individually. She has done her own research, and has gone out of her way to find ways to help my daughter learn in the best way that fits my daughter best. Mrs. Signore actively collaborates with other educators in the school system for input. She happily welcomed celebrating Down Syndrome Awareness month in October and also World Down Syndrome Day in March. She put together a great curriculum including stories, books and activities to help spread awareness. My daughter LOVES Mrs. Signore. She loves helping out in the classroom and wants to be a teacher when she grows up. Amber even asks about Mrs. Signore on school breaks! My daughter is in a looping classroom, and gets to be with the same peers and teacher in 1st and 2nd grade! We are so lucky to be able to have Mrs. Signore twice! I would like to nominate my son’s terrific teacher, Margie Clevenger, because of the impact she has made on our lives. She coaches Special Olympics, attends our local Buddy Walk, shows up at events outside of school, and is simply fun. Her classroom instruction goes beyond traditional teaching and includes hands-on, interactive activities to help her students make connections on how the lesson applies to the world. To teach the concept of plotting coordinates on a grid, she turned a garden into a grid and let her students plant (or plot) their seeds. When she finds a student’s interest, she markets on that interest to get results in the classroom. After discovering my child loves 80’s hair bands, she used rock music to reward him for completing tasks. We saw academic growth thanks to Poison, Aerosmith, and Bon Jovi. When parents are struggling with a behavior, she offers to help even if that help must come after school hours. When my son struggled with haircuts, she brought in a large shirt from home to mimic a cape and worked with him each day. She took time out of her schedule to go with us to the salon when he got haircuts. She did this until the challenge was conquered. When he needed blood drawn, she went with us to the doctor to help with the process. She is determined to help each child meet his or her full potential. She celebrates their successes and encourages them through struggles. Her genuine love for her students is evident. In fact, she throws a birthday party to celebrate each child’s special day. This year, her classroom has a super-hero theme, which is fitting. In our lives and in the lives of her students, she certainly answers the “Bat Signal.” She proves that not all superheroes wear capes; however, she will pull one out of her closest if it helps a child learn. We love you, Ms. C.! My son Carson just might be the most polite, sweetest, & truly engaging child you ever meet! He is 6 years old & has yet to meet a stranger, but unlike most kids his age he wants to really know about each person he meets. Do they have a pet? A son or daughter? Are they married? Lol he’s very thorough. This language in him has really exploded since he started at a Montessori school in our area with his amazing teacher(s) Alyssa D’Apolito. Carson is the only child in his class with Down syndrome, actually the only one in the entire school but they have all accepted him just as he is. Alyssa has fought hard for Carson to be fully included in the environment making his own work plan to help him reach his goals & really see his daily successes. The improvement & growth in him these past two years had been mind blowing. We have had our struggles but are always met with optimism on how we can tweak things to make it work better. 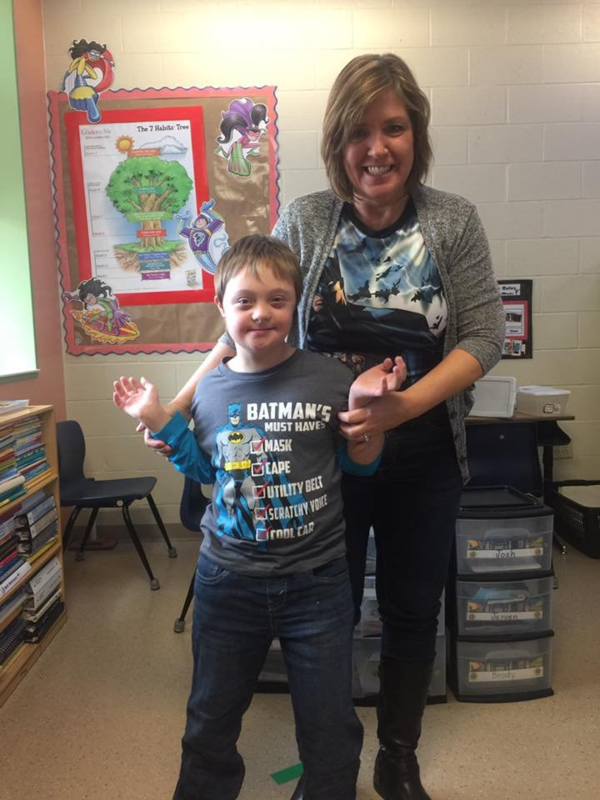 Recently for World Down Syndrome Day his teachers called us back up to the school. We had already left for the day for therapies & I wasn’t sure what was going on. We arrive in his classroom & all the students & teachers had made the Down Syndrome ribbon that said Carson’s Crew & were wearing it around their necks. They wanted to celebrate Carson & be a part of his crew. Just thinking of that moment brings tears to my eyes again. Teachers like this don’t come along often & I feel so lucky that Carson has such amazing people on his side all fighting for him! Congratulations to all of the teachers nominated in this year’s contest. 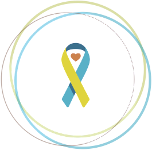 You are making a difference in the Down syndrome community, and we appreciate you! . The #DsTeachers contest is sponsored by ds-connex, and is one of four annual campaigns presented on our Facebook page. Check back in a few weeks for details regarding our next campaign: #DownSyndromeDads! Submit your story ideas to: support@ds-connex.org.